If you can make pancakes, you can definitely make crepes! I know that they might seem fancy, but they are incredibly versatile and can be served with both savory and sweet fillings and store extremely well. I recommend using a flat, lightweight griddle that fits over top of gas burners. I like to make two at a time and cool them on a wire rack before wrapping them in plastic wrap and storing in the fridge. Blend all ingredients in a blender or food processor until smooth. Refrigerate 1 hour or up to 8 hours covered. Heat a griddle or a crepe pan over medium heat. Coat with cooking spray. Transfer about ¼ cup of the batter onto the griddle or pan and spread it out with a small spatula or spoon. Cook 2 to 3 minutes until the crepe begins to brown around the edges, and starts to dry out on the top. Flip and cook an additional 2 minutes until the crepe is no longer wet in the center but still moist. Nutritional Stats Per Serving (2 crepes): 73 calories, 3 g protein, 11g carbohydrates, 2 g fat (0 g saturated), 1 mg cholesterol, 1 g fiber, 99 mg sodium. You need to use either Milk or 1% buttermilk, or both? And if both, how much Buttermilk I need to use? Hi Carla- it’s just 1/2 cup buttermilk. I just specify “low fat” buttermilk to keep the recipe a little lighter, but I think it’s tough to even find the full fat buttermilk! Thank you so much, I will do the recipe tomorrow. I was trying to find healthy food for years and I am glad to be around. I do crepe all the time, French edition. Thank you again for the reply, my kids will love it for sure. 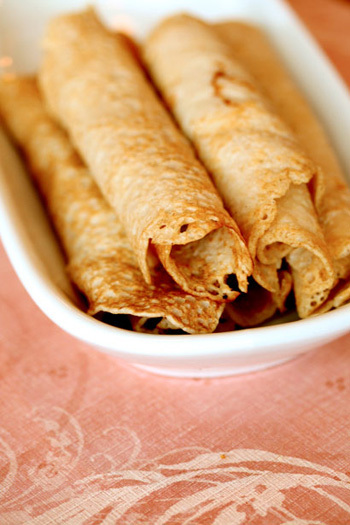 Kids love crepes because they have a nice soft texture. You could even do a little smear of peanut butter (or almond butter) and pack them for a school lunch. They did love it so much, it is exquisite. I will do it for the school field day, they will love it as much as we did at home for sure. I just made these and I have to say they are great!! I did change it up just a little. I added 3tlbs of splenda to the batter and a little lemon zest since I was using them for a dessert crepe. My family and I really liked them and I will be making them again and again! So cool,Actually i don’t know how to cook but when I found out your site It so great . It makes me interested to try some recipes. Absolutely- both skim and 1% sub well in this recipe. Thanks for visiting! well thank you for this recipe i made it yesterday but i actually used organic vanilla soy milk. I made them for breakfast and it was a hit with my kids and my husband. Today i made them with the soy and used them for a turkey wrap ( i was out of bread ) Yet again a hit with the kids and with my husband. Thank you for your healthy recipes! Can you use 2% milk if you have no butter milk ? Sure, just add a teaspoon of vinegar to make your own curdled milk! I only have whole wheat flour. Not whole wheat pastry flour. Will it still work? What adjustments need to be made to the recipe? Whole wheat flour is a sturdier, heavier flour. Mix 1/2 whole wheat with 1/2 white flour to achieve the same effect. Great question!